Boarding completed! 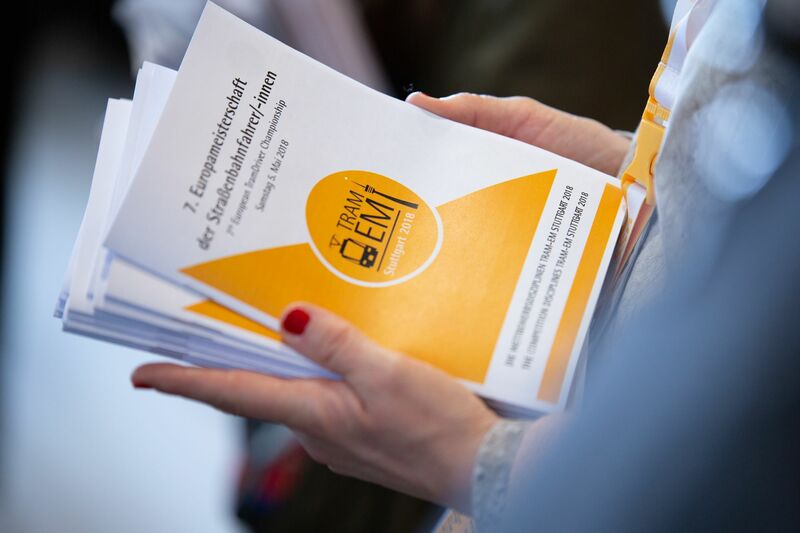 25 teams from 21 nations participate in the 8thTRAM-EM – more nations than ever before. 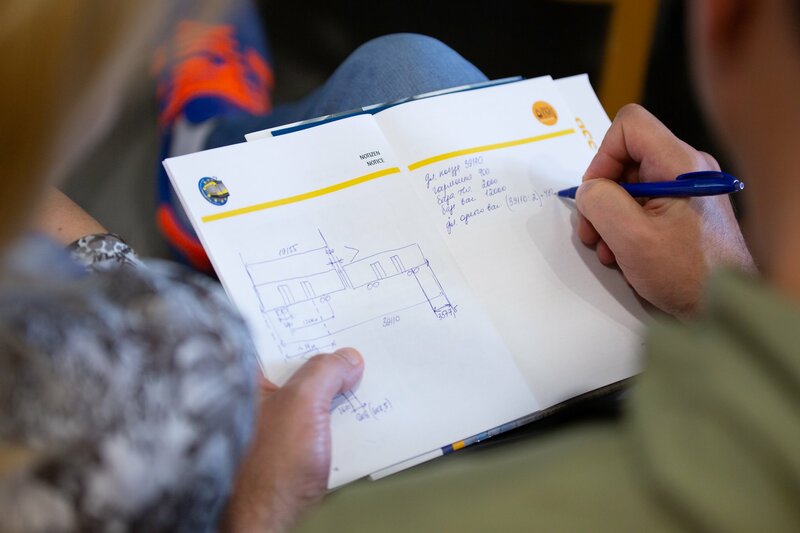 We are looking forward to welcoming teams from Barcelona, Basel, Bergen, Berlin, Brussels, Budapest, Dresden, Dublin, Gothenburg, Helsinki, Istanbul, Krakow, Luxembourg, Milan, Malaga, Manchester, Moscow, Oradea, Paris, Porto, Prague, Rotterdam, Stockholm, Stuttgart, and Vienna. … and family entertainment all day long, with tram presentation, kids area, and many more more. We are looking forward to welcoming a lot of fans and spectators. The entry is free! 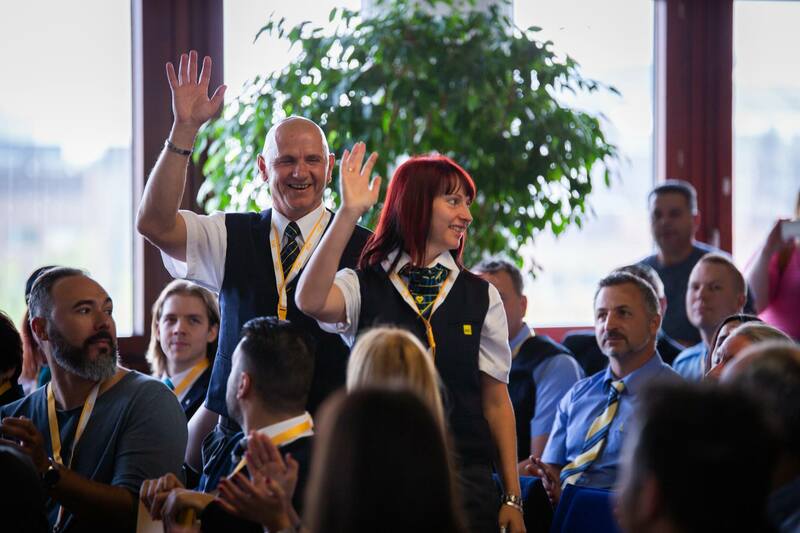 In an exciting ceremony the TRAM-EM family celebrates its champions together with a lot of spectators. Congratulations to the best team, the best male and female driver again. All participants are winners! 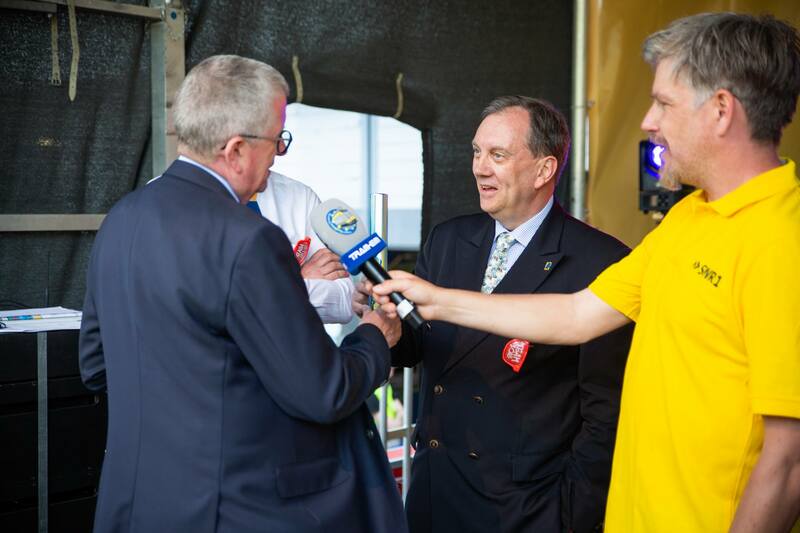 In this sense, Wolfgang Arnold, spokesman of the SSB, hands over the baton to Marc Coudyser and Roland De Coster, representatives of the STIB Brussels. 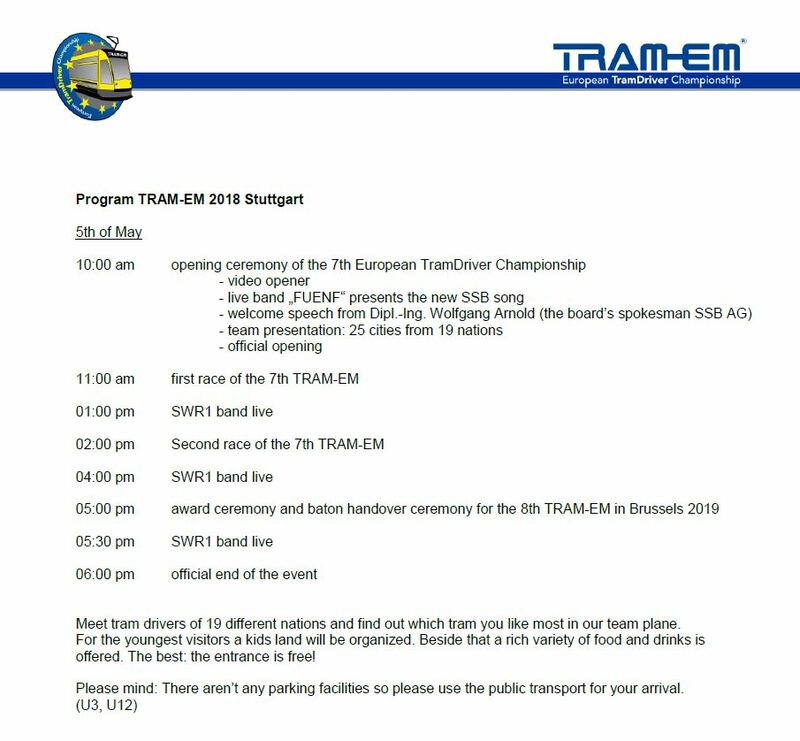 There will take place the 8th TRAM-EM on May 4th, 2019. 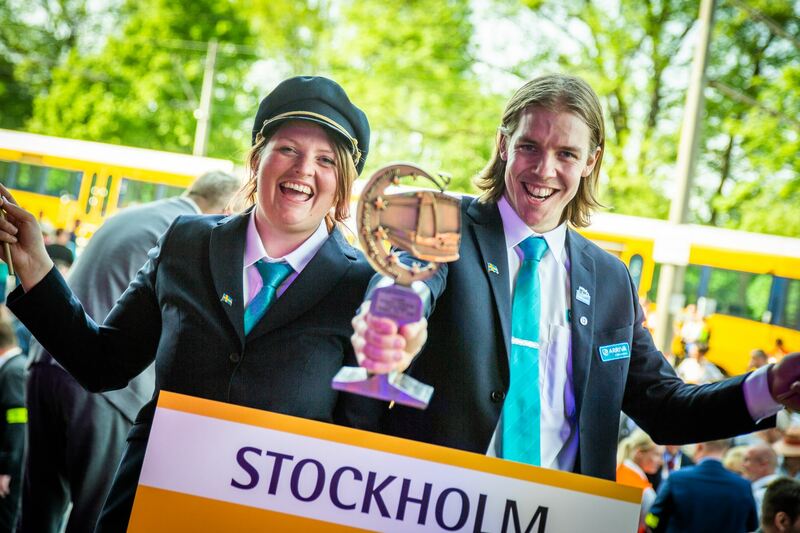 European’s best Tramdrivers 2018 come from Stockholm! 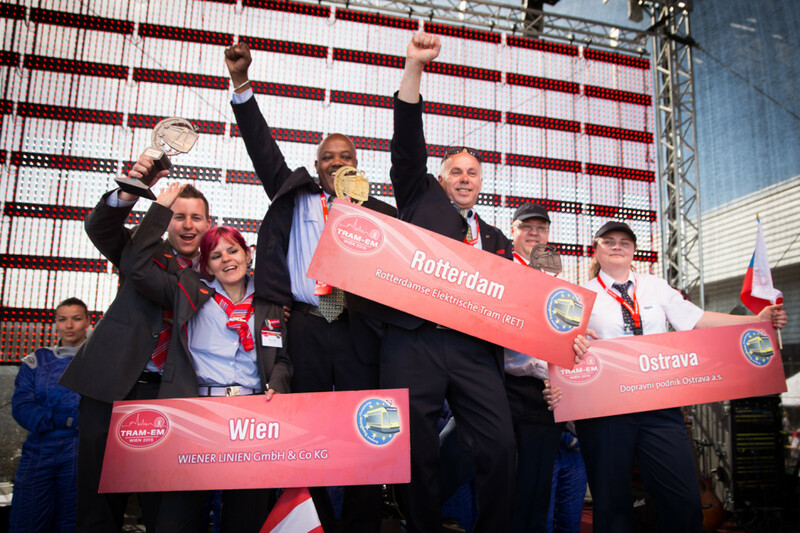 A record number of 25 teams from 19 European nations came together on May 5, 2018 in Stuttgart to compete for the titel “Best European Tramdriver”. More than 300 individual decision demanded teamwork, driving skills, speed and of course a bit of luck. Start for the 7th European TramDriver Championship! What an amazing friday morning: 50 happy and nervous drivers follow the welcome speech of Dr. Sabine Groner-Weber. She presents the South German company and the program of our 7th TRAM-EM. Afterwards each team presents itself with a smart video and a big Hello in the common round. The big question every year: What are the disciplines about? 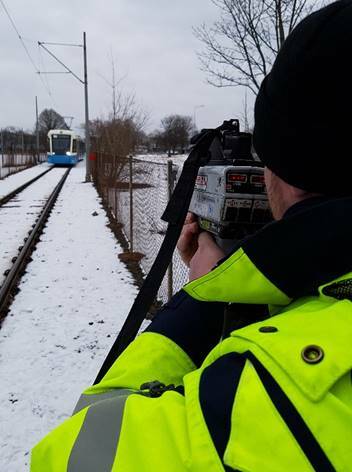 The lessons 2018 are: Schwip-Schwap-barrier, speed up the tram to 25 km / h with a subsequent target brake, lateral distance in the curve area, on the way back the exact stop with one door, an overrun test where the driver has to stop with the back front on an dartboard, and finally tram bowling. Now it’s time to find out how the local vehicles work. The training lessons on the SSB depot can start! Happy Birthday – the Stuttgart tram celebrates its 150th birthday! Since 1868 the company brings their passengers in the capital city of Baden-Württemberg from A to B. So the public transport company from Stuttgart is the third-oldest in Germany. From April the city celebrates this with a “Busmuseum”: it is an oldtimer bus where the companies history is presented. There are also organized city walks to historic places of the SSB and some new exhibitions in the tram museum. 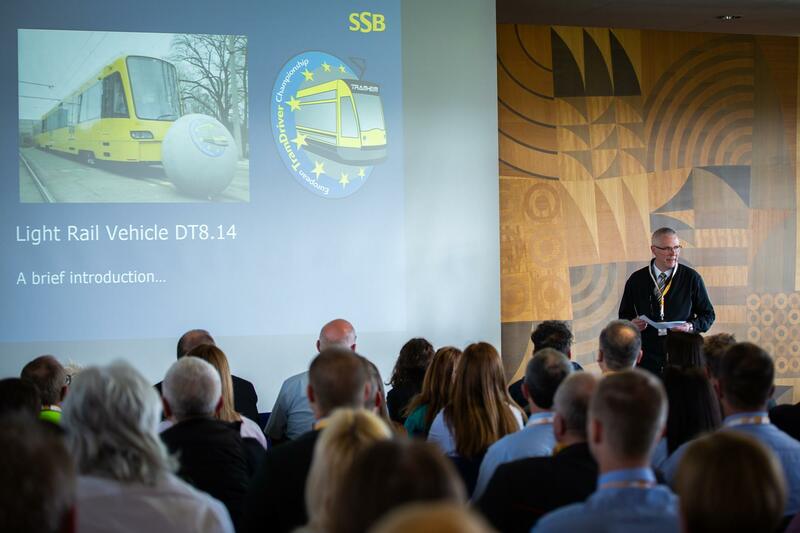 The highlight is the 7th European Tram Driver Championship on the 5th of May at the SSB depot at Schockenriedstrasse 50, in 70565 Stuttgart. 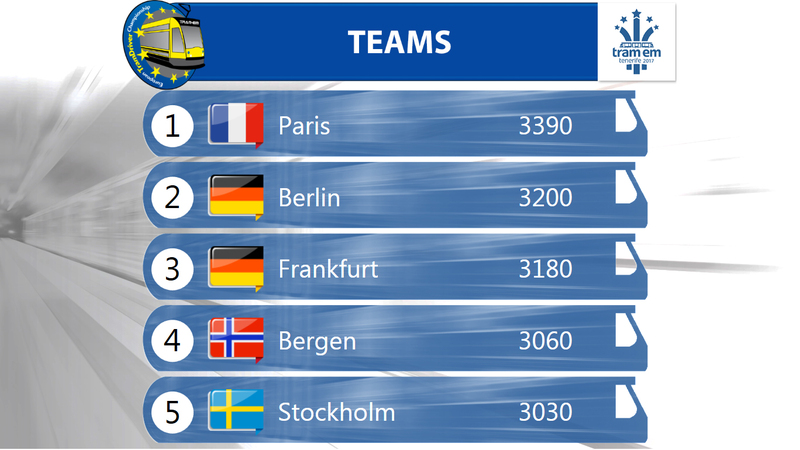 From 10:00 am 25 teams from 19 countries want to know who is the best on the rails. We are looking forward to greeting many visitors and will lovely invite you to experience this event. 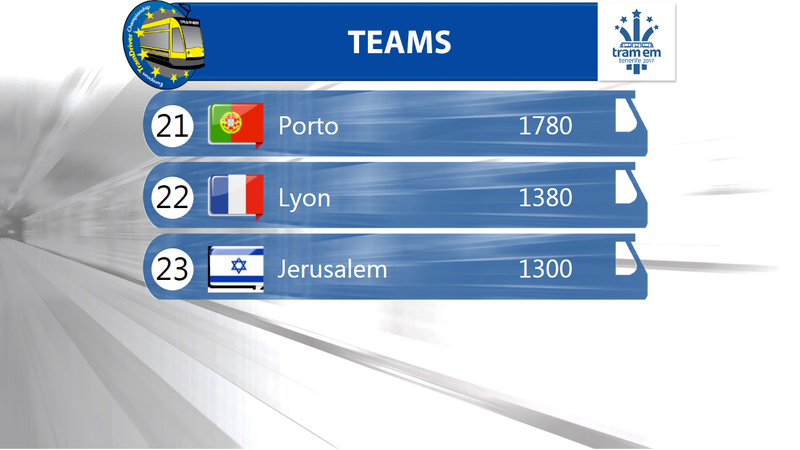 So different these four cities are, they have one thing in common: They all prepare for the TRAM-EM with disciplines nearly similiar to a real championship and choose their team. Everyone likes to travel to Stuttgart on the 4th of May as well prepared as possible whether in Dresden, Stockholm, Gothenburg or Rotterdam. 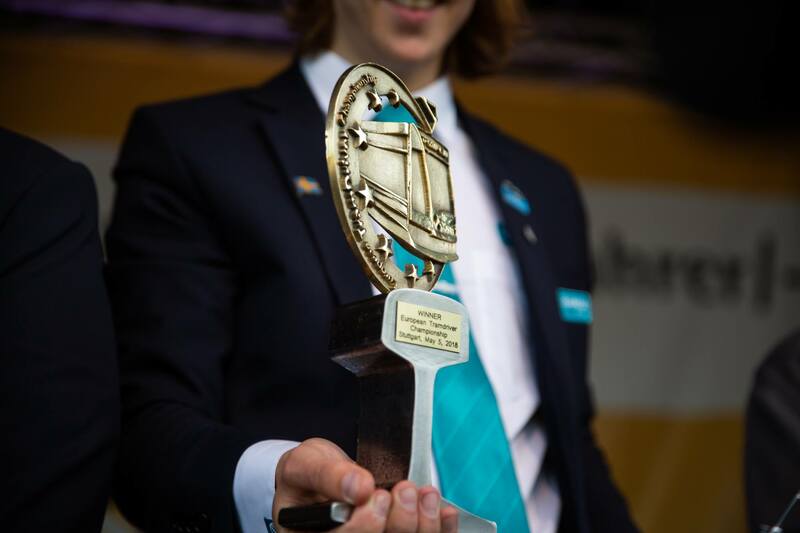 Driving the tram up to special speed with a covered speedometer,, driving the tram towards an obstacle as near as possible or putting an dummy on the road and driving as near as possible: Your disciplines are really at a championship level. 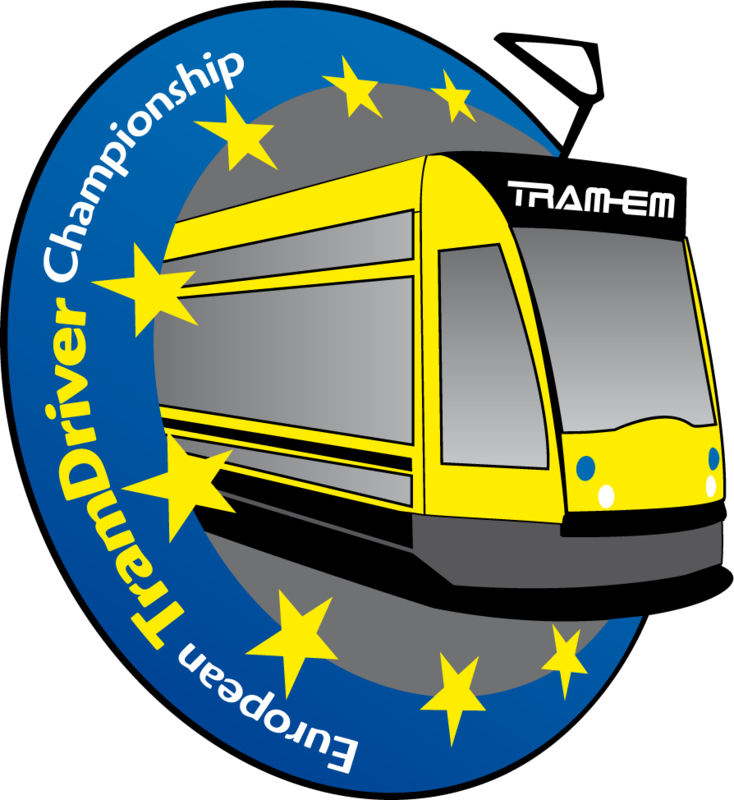 The waiting has finally come to an end: We are excited to present you the the amazing program of the 7th European TramDriver Championshi. The championship takes place on the 5th of May on the SSB depot, Schockenriedstraße 50 in 70565 Stuttgart. We are looking forward to greet everyone of you! 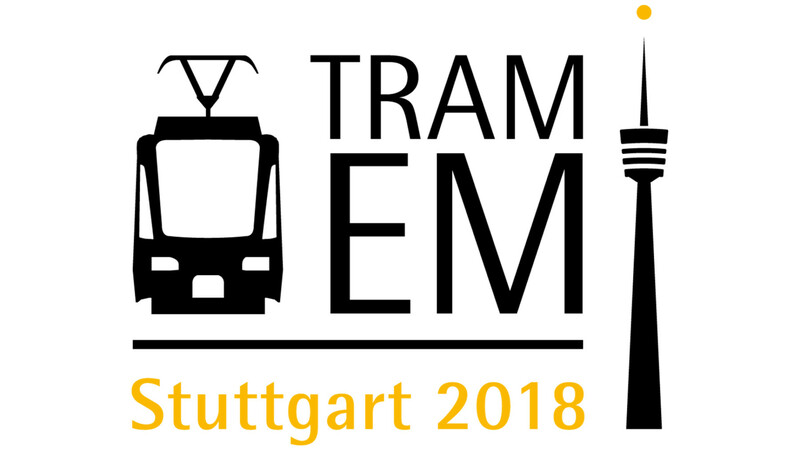 the latest logo of the TRAM-EM 2018. 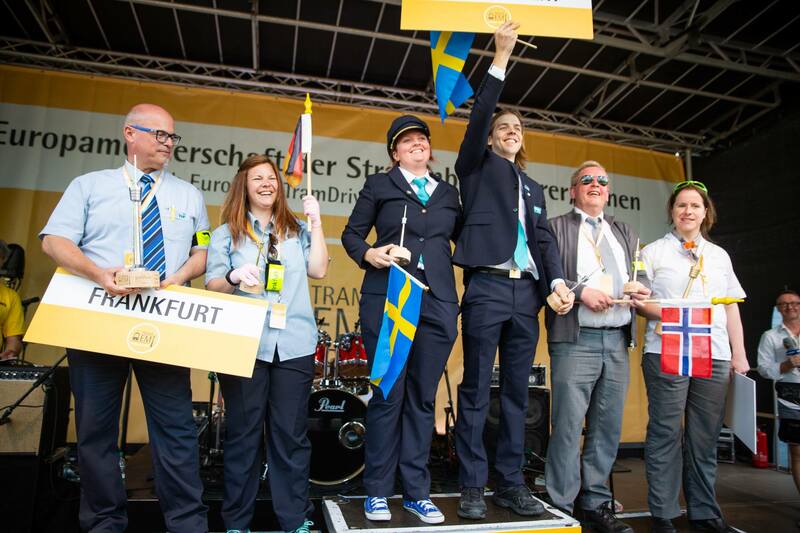 In this year Stuttgart clears the tracks for the teams of the 7th European TramDriver Championship and welcomes you all at their domestic premises on the 5th of May. Therefore: Everywhere you can find the logo the future European Champions can’t be far away. We are excited! 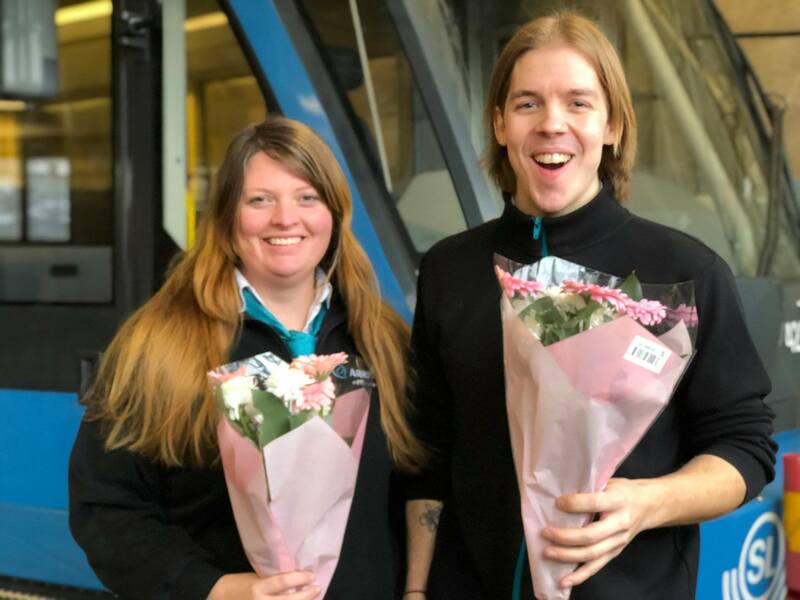 Corinne Leroy and Karim Annouche from the RATP team Paris competed against 44 other tram drivers from all over Europe on June 4, 2017 in Santa Cruz de Tenerife. (Deutsch) Auf Wiedersehen Teneriffa, Hallo Stuttgart! 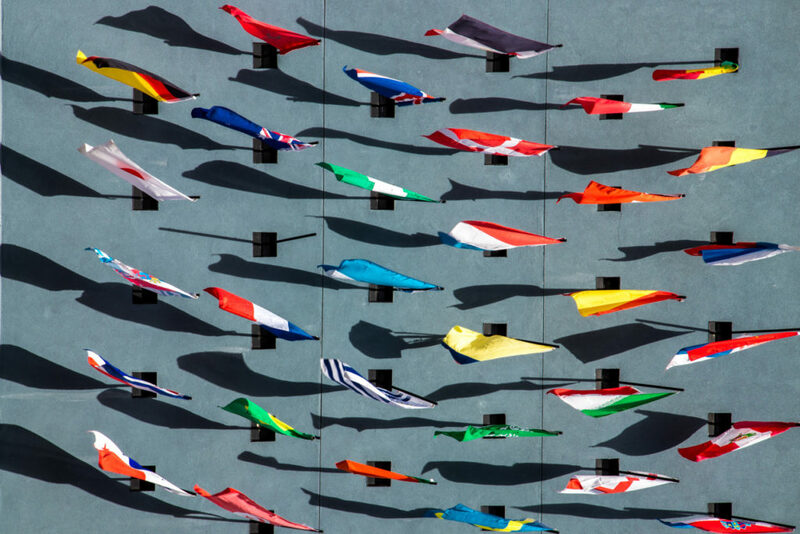 Ci spiace, ma questo articolo è disponibile soltanto in Tedesco, Inglese Americano, Francese e Spagnolo Europeo. Per ragioni di convenienza del visitatore, il contenuto è mostrato sotto nella lingua principale di questo sito. Puoi cliccare su uno dei links per cambiare la lingua del sito in un’altra lingua disponibile. Die Koffer sind verpackt. Viele Mannschaften sind schon auf dem Rückflug. Wir bedanken uns bei allen öffentlichen Verkehrsbetrieben, die ein Team nach Teneriffa geschickt haben. Es war wieder ein tolles Erlebnis, ein wundervolles Wochenende in Santa Cruz und eine erfolgreiche 6. 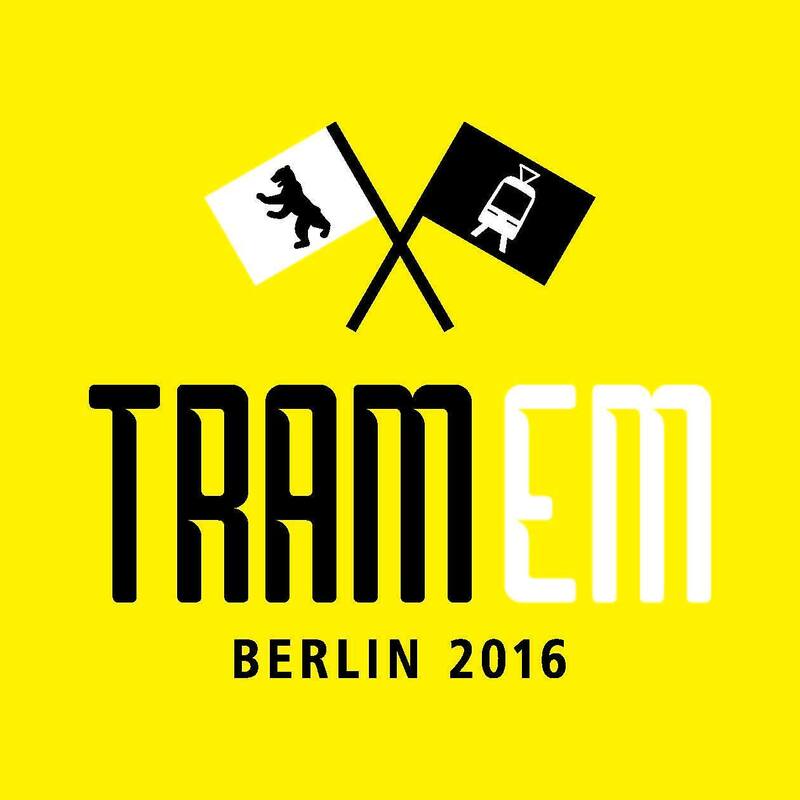 TRAM-EM. 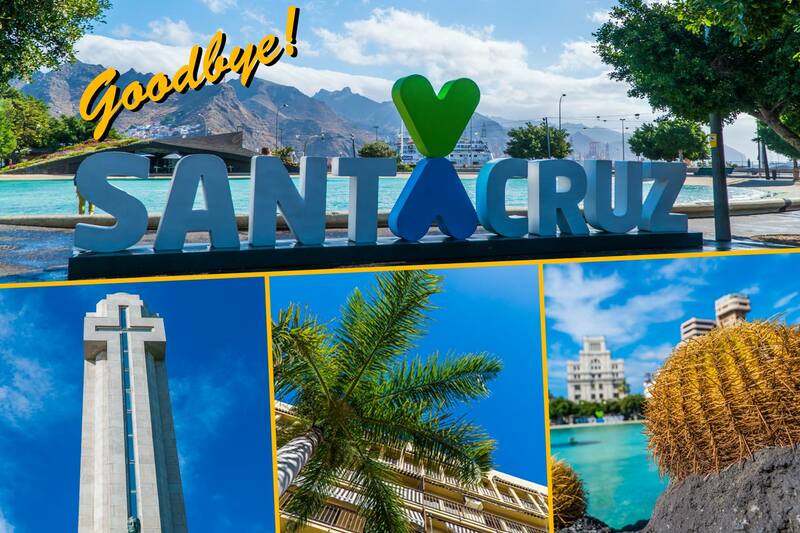 Unser besonderer Dank gilt den Gastgebern von MetroTenerife! In einem packenden Finale erreichten Corinne Leroy und Karim Annouche aus Paris den Titel “Straßenbahn-Europameister 2017”. Es folgen Berlin auf dem zweiten Platz und Frankfurt auf dem 3. Platz! Den Titel “Europas beste StraßenbahnfahrerIN” gewann Franka Sonntag von Berlin gefolgt von Zsuzsanna Ledniczki aus Budapest und Alexandra Engeseth von Bergen. Der beste europäische StraßenbahnfahrER ist Karim Annouche von Paris gefolgt von Thilo Korbien aus Frankfurt und Christoph Engelmann von Zurich. Wir gratulieren allen Teams zu einer aufregenden Meisterschaft! (Deutsch) Was für ein Tag! Gleich beginnt die 6. 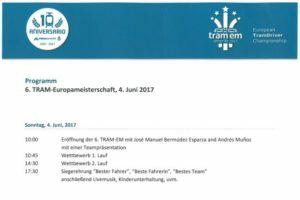 TRAM-EM 2017 in Santa Cruz de Tenerife! Wir freuen uns auf eine spannende Meisterschaft! (Deutsch) Start für die 6. 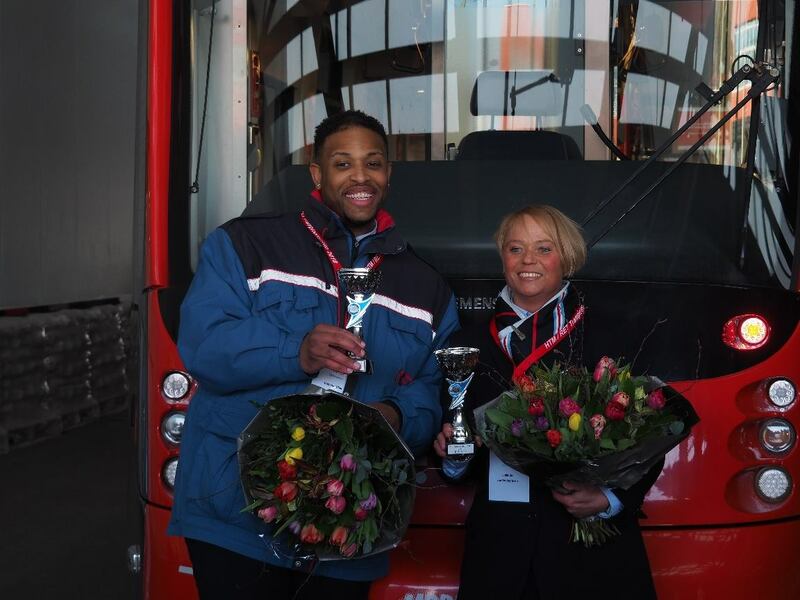 European TramDriver Championship! Was für eine Atmosphäre heute Morgen: 46 glückliche und aufgeregte Fahrer folgen der Begrüßungsrede von Andrès Munoz de Dios, Geschäftsführer von Metrotenerife. Er präsentiert seine Firma und das Programm der dreitägigen Veranstaltung. Danach präsentiert sich jedes Team mit einem Video und einem großen Hallo in der gemeinsamen Runde. Und schließlich: die Vorstellung der Meisterschaftsdisziplinen wird jedes Jahr sehnsüchtig erwartet. Im Jahr 2001 gründete die Regierung „Metrotenerife“, ursprünglich als Alternative für den Transport auf Eisenbahnlinien gedacht. Am 2. Juni 2007 wurde die erste Straßenbahnlinie eröffnet, zwei Jahre später folgte die zweite Linie. Seit ihrer Gründung hat Metrotenerife mehr als 132 Millionen Passagiere befördert. 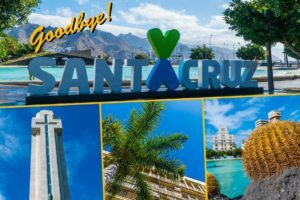 In wenigen Wochen feiert die Straßenbahn von Teneriffa mit einer großen Feier in Santa Cruz ihren 10. Jahrestag. TRAM-EM sotto le palme – Save the date! Vacanze, spiaggia e palme: ecco cosa viene in mente pensando a Tenerife nelle Isole Canarie. Ma il 4 giugno 2017 si aggiungerà un altro elemento alla lista: il tram! I migliori autisti di tram europei gareggeranno nella sesta edizione del TRAM-EM che si svolgerà nella capitale, Santa Cruz. Budapest vincitrice per la seconda volta! Le emozionanti gare della 5° edizione del TRAM-EM svoltasi a Berlino sono giunte al termine e il vincitore è… BUDAPEST!!! Congratulazioni! 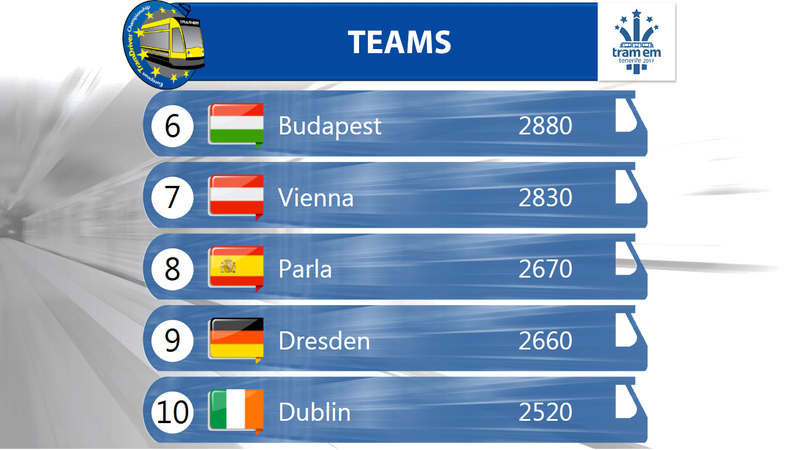 Quattro anni dopo la vittoria alla prima edizione della TRAM-EM nel 2012 a Dresda, Budapest può andare ancora una volta orgogliosa del titolo “Miglior autista di tram europeo”. Für alle, die nicht persönlich in Berlin dabei sein können, übertragen wir die Meisterschaft mit 12 Kameras von 10:00-17:30 unter auf unserer website www.tramem.eu. Die TRAM-EM wird zudem im RBB-Fernsehen via Kabel und Satellit übertragen. Schaltet ein am 23. April, um 18.30 Uhr. 27 team da 17 paesi europei prenderanno parte alla competizione del 23 aprile per determinare chi sarà il campione di guida su rotaie. Le squadre registrate sono: Barcellona, Bergen, Berlino, Bruxelles, Budapest, Cracovia, Dresda, Firenze, Francoforte sul Meno, Helsinki, Lipsia, Lione, Madrid, Oradea, Ostrava, Parigi, Rotterdam, Stoccolma, Stoccarda, Tenerife e Vienna. Siamo particolarmente lieti di dare il benvenuto alle new entry da Birmingham, Göteborg, Innsbruck, Porto, Praga e Zurigo. I primi pullman di fan sono già stati annunciati, ad esempio da Dresda, Vienna, Budapest e Zurigo. Incontra gli autisti di tram da 27 città europee e scopri i tuoi preferiti nel driver camp. Disponibile un’area giochi per i bambini. Saranno disponibili le ultime offerte di lavoro della BVG. Rinfresco in loco. Entrata libera. Erstmal gibt es für die TRAM-EM eine offizielle Hymne. Sie heißt „ALLES AUF GOLD“ und kommt von der Berliner Band Venterra. Wer Venterra live erleben will, hat dazu am 23. April 2016 Gelegenheit. Die Jungs spielen auf der TRAM-EM-Bühne im BVG Betriebshof Berlin-Lichtenberg, Siegfriedstraße 30-45. Le discipline sono state scelte! Finalmente sono state scelte le discipline del 5° TRAM-EM che si terrà il 23 aprile a Berlino. In collaborazione con la società di trasporti berlinese, la BVG, si è svolta una lunga discussione riguardo alle prove da svolgere e sono state finalmente decise le 5 categorie di competizione. Divertimento e adrenalina non mancheranno in questo campo di 150 metri munito di 3 binari e 2 diversi tipi di tram. Ci saranno valutazioni a punti e a cronometro per 4 discipline. Da non perdere, lo stesso giorno, si svolgerà anche il famoso TRAM-Bowling. Al 22 aprile 2016 l’annuncio delle sfide che gli autisti dovranno affrontare. Vom 22.-24. April 2016 findet die 5. Europameisterschaft der Straßenbahnfahrer/-innen in Berlin statt. Höhepunkt werden die öffentlichen Wettkämpfe am 23. April sein. 25 Teams aus 16 Ländern wollen dann wissen, wer beherrscht Strecke, Material und Nerven am besten? Neu ab dem kommenden Jahr: Neben der etablierten Teamwertung gibt es erstmals auch Einzelwertungen für Damen und Herren. In un finale avvincente Orlando Cairo e Will Breur da Rotterdam si affermano su altre 22 squadre. Al secondo posto seguono Nicole Vanek e Markus Fiedler da Vienna, e al terzo posto Renáta Burdíková e Roman Decky da Ostrava. Tutti gli altri piazzamenti sono stati riassunti in un grafico. i difensori del titolo Parla (Madrid), la squadra ospitante Vienna, la squadra Barcellona, Bergen, Berlino, Bruxelles, Budapest (vincitori nel 2012), Dresda, Firenze, Graz, Helsinki, Cracovia, Lipsia, Lione, Manchester, Norrköping, Ostrava, Oradea, Parigi (vincitori nel 2013), Rotterdam, Stoccolma, Stoccarda, e Tenerife. (Deutsch) Der TRAM-EM Pokal ist da! Stolz und zufrieden präsentieren wir heute erstmal den offiziellen Siegerpokal der Europameisterschaft. In Barcelona laufen die Vorbereitungen für die 3. Europameisterschaften der Straßenbahner auf Hochtouren. 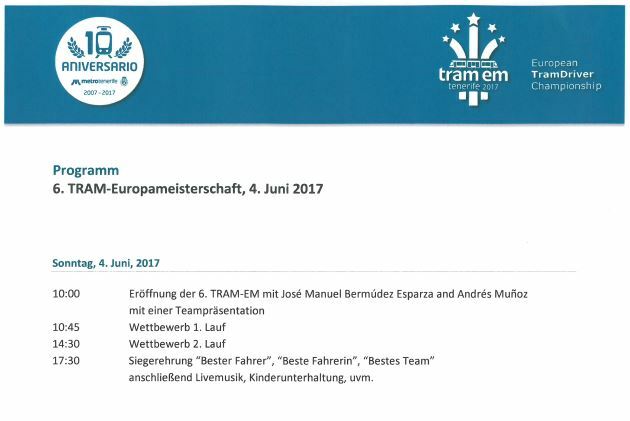 Das Team um José Triano Romero, Leiter Fahrbetrieb von TRAM Barcelona, hat die Tests der 6 Wettkampfdisziplinen erfolgreich abgeschlossen. Neu im Wettbewerb ist Straßenbahn-Bowling – Es verspricht also einmal mehr lustig zu werden. Il nuovo marchio TRAM-EM info-libretto è qui! 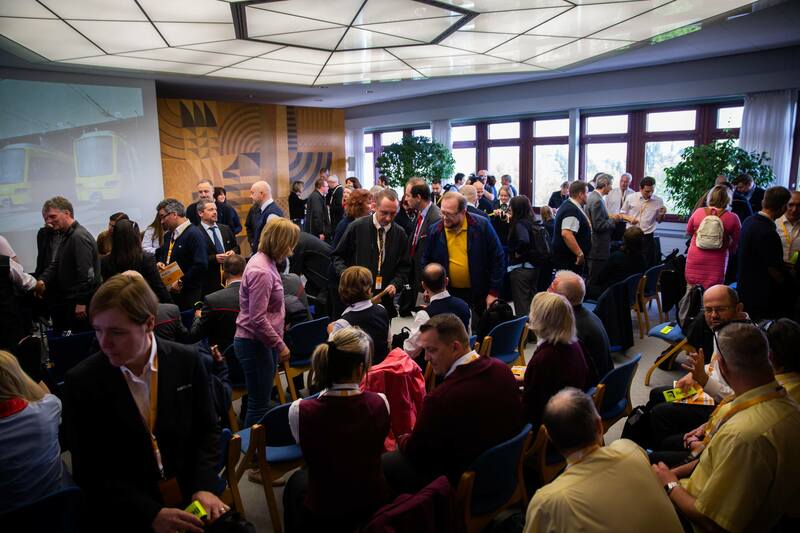 auf diesem Weg möchten wir uns bei Ihnen noch einmal ganz herzlich für die professionelle Organisation rund um die erste Europameisterschaft der Straßenbahnfahrer 2012 bei den DVB in Dresden bedanken. Unsere beiden teilnehmenden Fahrer waren voll des Lobes wegen der gelungenen Veranstaltung. “Sehr geehrte Damen und Herren!